DISCONTINUED. The Logic Code Combi ES boiler is a gas fired model which will supply hot water and heating on demand directly from the mains water supply. This means you don't need to have bulky tanks or cylinders making it a perfect choice for smaller homes where space may be limited. 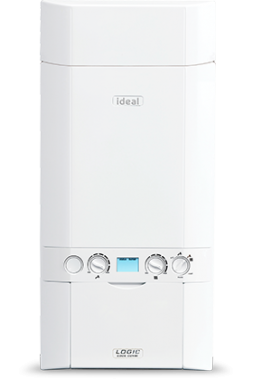 This unit is a condensing, wall mounted boiler that has been designed and manufactured by Ideal using advanced technology. It is a unit that is capable of supporting up to level 4 of the code for sustainable homes. It’s also highly efficient at 91% meaning it meets the SAP and DER ratings. It has an output rating of 33kW making the unit perfect for medium sized homes that don't have an excessive need for hot water. This boiler includes a wide range of different features and benefits such as built-in pipework and minimum overall height to give it an easier installation. This should save you both time and money. This boiler also includes a built in stainless steel recuperator located in the flue exit which helps to pick up and recycle wasted energy that would normally be lost through a flue terminal. The energy that is collected is used to heat the water supply. This unit also comes with a high DHW flow rate which is approximately 10% higher than a standard boiler. This compact boiler is available in three different models: 26kW, 33kW & 38kW. It includes a 2 years parts and labour warranty to give you peace of mind that you have bought a highly reliable boiler.